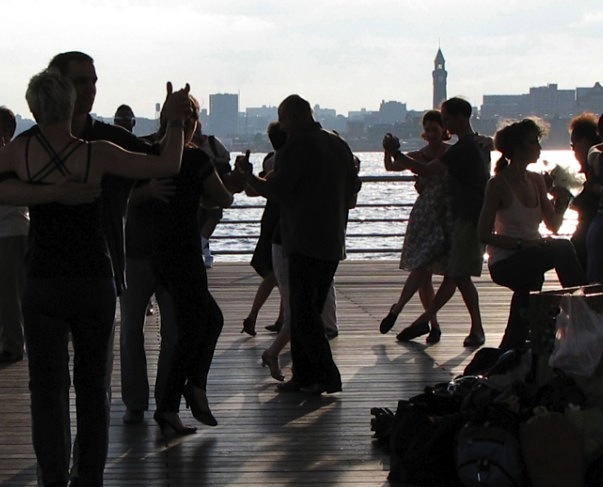 I was out walking down the river with my friend Howard and we passed by these people dancing. They were doing the tango. I have to say, the heat makes me so depressed. I don’t do well once the temperature hits 90. In truth, I’m such a heat-wimp 88 is probably my true upper limit. I’m grateful for air-conditioning, but after a few days holed up in it I feel like the last zombie on earth. There are no more people with brains to eat, and no more fellow zombies to fight over what’s left. I’m glad it seems like we’re getting a break. It was so invigorating just taking a simple walk along the river. There was a breeze and the heat wasn’t beating-down-oppressive and I felt alive again. 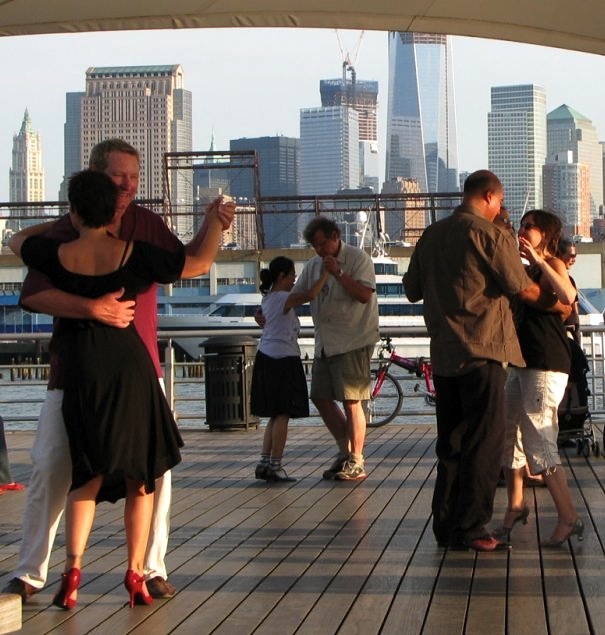 I walked around the dancers, trying to get landmarks into the background of the shots, like the Empire State Building. But the best shots were the dancers blocking it. 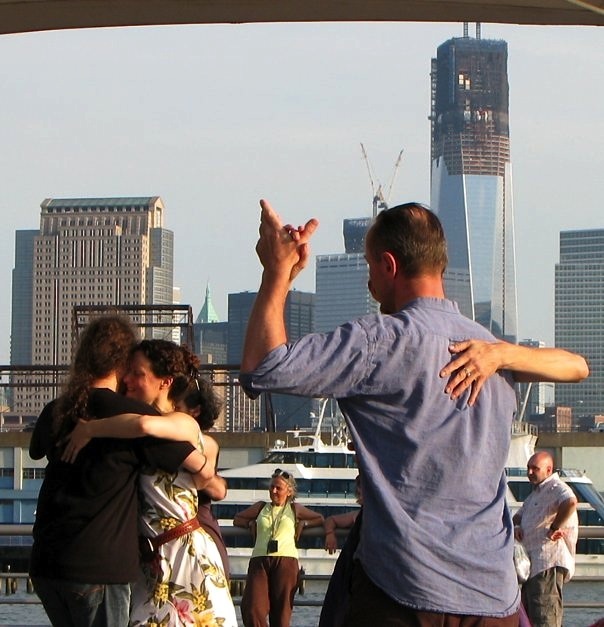 I did like capturing people dancing with the growing One World Trade Center in the background though. It’s a nice recovery shot, I thought. I wish I had zoomed in on the girl in the flowered dress. She looks so happy. I was in that exact spot yesterday morning/afternoon. Guess I was too early to see the dancers. What fun! Go to my FB page to see my shot of the Empire State Building. I’m with you. I hate the heat and it makes me totally grumpy. Glad there’s a reprieve for us this week. Nice shot! It looks like you’re farther out than the end of the pier, it looks like you’ve taken that from out in the river! Your pictures are lovely! 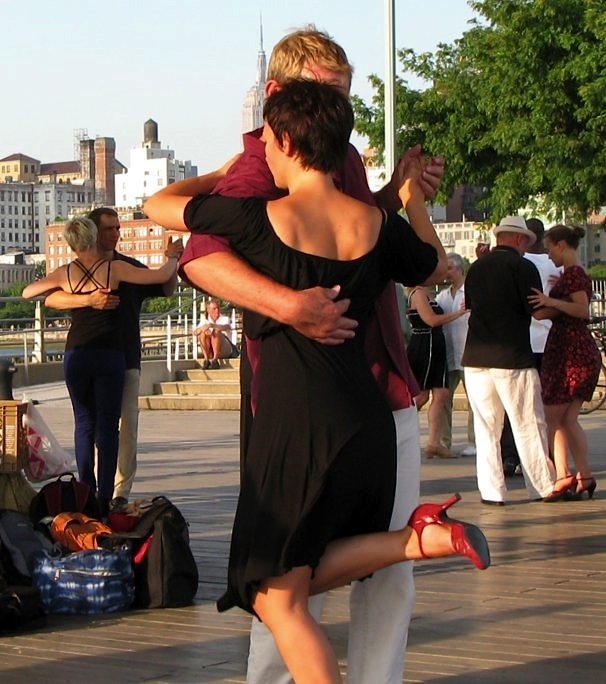 I tried to illustrate dancers like these on the Pont des Arts in Paris but my reference photos were crap and the scene was, anyway, way beyond my ability — now I see that shadows are the key, long delicate shadows and gold light (I used blue…wrong mood). Also having such an artist’s eye as yours would have helped. You’re too kind! You take enough shots and something comes out! I’m jealous that you got to give it a try in PARIS.